Joe Riggs’ (pictured) return to the UFC will have to wait for another day. On Tuesday, the promotion announced the veteran will be forced to withdraw from his September 13 scrap against Paulo Thiago after accidentally shooting himself. Riggs agreed to replace injured Mike Rhodes to face Thiago inside Nilson Nelson Gymnasium in Brasilia, Brazil. The UFC is now scouring the globe for a substitute for Riggs. 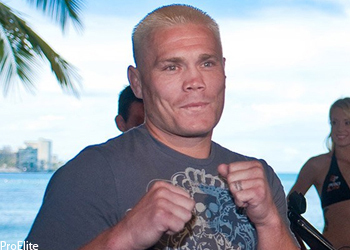 Riggs exited the UFC in 2006 after a knockout loss to Diego Sanchez. The 31-year-old was brought back on the strength of a six-fight winning streak.